Katerina Stefanidi is a Greek pole vaulter. She won the gold medal at the 2016 Olympic Games with a jump of 4.85 meters., while she has also competed at the 2012 Summer Olympics. She is the current European outdoor (2016) and indoor (2017) champion and a World indoor championships medalist. Namita Nayyar, President Women Fitness catches up with Katerina Stefanidi on fitness, Olympics and motivational tips. You are the 2016 Olympic Games Gold medalist, the current European outdoor (2016) and indoor (2017) champion and a World Indoor Championship medalist. Walk us through your spectacular journey and tell us how it all began? I started pole vaulting when I was 10 years old. The very first day I went to try it the coach told me that he thinks I could be really good. I had a lot of success very early. At 11 I broke the 11 year old age group record. Same for 12, 13 and 14. At 5 I broke the world youth (Under 18) record and that same summer I won the IAAF world Youth Championships even though I was a couple of years younger than most of my rivals. I was off to a great start but teenage hood hit me and I gained weight. Even though things were not going the way we expected and wanted I still won the Silver medal at the 2007 World Youth Championships and bronze at the 2008 World Junior Championships. In 2008 I accepted a scholarship from Stanford University and in September of that year I moved to the US. My first year in college did not go well for several reasons but my second year there was a coaching change. The Athens Olympics Silver Medalist in the pole vault Toby Stevenson became our coach. He was one of my favorite pole vaulters and he definitely brought the fun back to the event for me. The next three years of college I kept getting better and better and my senior year I won the NCAA championships and qualified for the London Olympics. In 2013, and as my coach had to leave Stanford, I moved to Arizona to train with the 2000 Olympic Champion Nick Hysong. I had two great years with him in 2014 and 2015, winning silver outdoor and indoor European medals, but for personal reasons my husband and I decided to move to Ohio in the fall of 2015. He has been coaching me since and things have been going great. 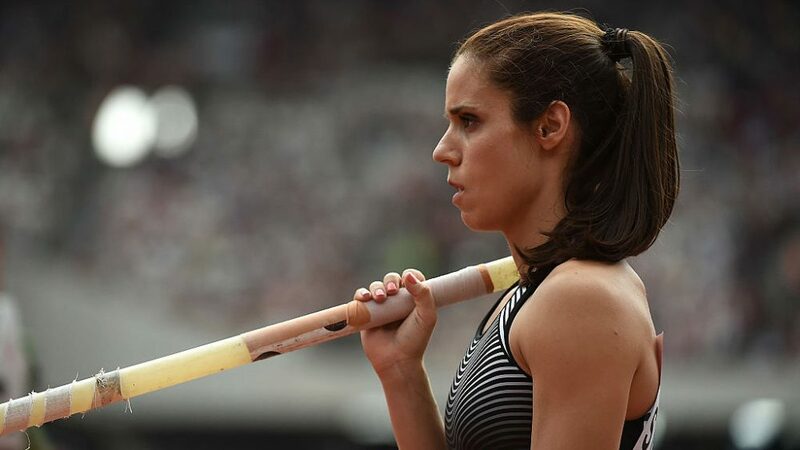 Introduce us to a day in the life of a pole vault athlete, preparing for the Olympic Games. It was like any other year for me. We went to practice every day. Focused on what we had to do and then went home. Nothing special or crazy. We did change some of my training and it kept me a lot healthier and I also started eating a lot better that helped with my fitness. But other than that I just went to the track every day, did my job and went home.